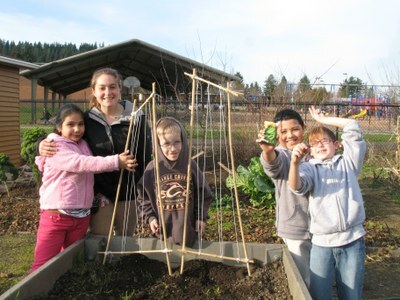 Our Youth Grow Program bridges garden-based education to student curriculum, increases family engagement within the school community, and brings fresh food to cafeterias and local families. Garden Assistant volunteers support our lead Garden Educators in delivering hands-on indoor and outdoor garden activities. We are partnered with nine schools located in North, Northeast and Southeast Portland. To view our partner school locations click here. The fall term runs from early October through December from 2:30-6 pm once a week, typically for 8 weeks. Each garden club happens on different days (Monday, Tuesday, Wednesday, or Thursday) depending on our school partner.